Ok, I have to admit, I let these fantastic gold socks slide the first time I saw them at H&M and didn’t actually pick them up until the next time I came back. But that’s true love, right – if you love something and you let it go and it still comes back to you, then it’s meant to be? Well, that’s what these big-hearted little socks did for me. Maybe everyday is Saturday morning, two daughters and a wife. OMG, SHOES! … sorry. i LOVE em! wow, I LOVE THE SOCKS and the shoes! They look so good together. Wow. I am glad you went back for the socks =) Love the rest of the outfit too! Loving the socks – definitely meant to be. Would have never thought to put all of this together but it just works. It also reminds me, I need to add denim button-down to my shopping list! I agree with the sparkle socks %100, especially with those shoes. You always look so ethereal, even when you're wearing tougher pieces, like the skirt and shoes. I think it balances beautifully!! Oh I want some socks like that! They're kinda sweet but kinda edgy. haha so true – i always love the feeling of leaving something until you just HAVE to have it. the socks look awesome lucky you went back! i totally know what you mean! Although the true love thing probably works better with clothes than with guys! I've found plenty of clothes back into my heart and I swear it was meant to be! It just makes getting that item even sweeter! You and those socks=a true love story for sure. Meant to be!!! love the sparkly socks with the shoes… so sweet. so darling. I love your sense of style. It's very you! Adore your denim shirt with that zipper skirt:) Beautiful mix here ! And yes yes those gold socks are darling and so gorgeous. They are indeed true love ! Oh girl, can i have your legs? i love this outfit. And the oversized polo shirt, you carried it well. sparkle socks!!! I love. And love the photos from the last post, those trees are kind of awesome even though I'm also kind of sad for them haha. Killer skirt too. I love that Beach Boys song 🙂 Your necklace looks cute. this is an awsome look ! i love the boots paired with the socks . i never have the courage to do this because nobody really wears socks in my country unless you're wearing sneakers . ahha . 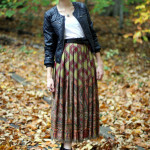 the leather skirt is rad ! You have Wonder Woman's socks !!! YES! I totally agree. I think whenever you can't stop thinking about something and you 'visit' it in the store… then it's true love and it's your duty to buy it! you pulled off the sock trend perfectly. as always you look amazing, the jeans shirt and socks are the best! Love the socks. They're very fun and sparkly. HOT HOT HOT… I love the entire ensemble. Have to post another one… those shoes are fabulous and I didn't think it was Forever 21. You've got style girl. look at you in your snazzy socks! love the skirt! I'm so in love with how you paired the sandals and socks. awesome skirt… you look perfect as usual! Loving the combination of jeans and leather! you look great! those socks are fantastic!! You look so amazing! This is such a fabulous outfit. The gold socks and those beautiful shoes and that cool denim shirt! Those socks are the perfect touch to a casual outfit…I love everything about this. the socks with platform sandals really works here. love that leather skirt too. i do like the socks, but to be honest what i noticed first was how perfect your hair is! what do you do to keep your hair so perfect? or do you take the pictures right after you get ready? I wish my bangs would sit the way yours do.. how do you do it? !